The American Cranberry (the most familiar of the four cranberry species) is grown throughout the Northern United States and Southern Canada. Wisconsin produces about half of the United States' annual crop of cranberries. Massachusetts produces about a third with the remainder coming mainly from New Jersey, Oregon, and Washington. The berries grow on winding vines in sandy bogs and marshes. The berries begin white. The familiar deep red color is indicative that the berries have fully ripened. The cranberry is a relative of both the blueberry and the huckleberry. For you botanists, they all belong to the subgenus Vaccinium. The origin of the name "cranberry" has two possible explanations, both "stemming" from a relationship with long-neck cranes. One theory says the "crane-berry", as it was once known, was named so because cranes were common visitors to cranberry bogs where's they'd eat the berries. Explanation number two says the plant was named after cranes because the flowers on cranberry vines resembled cranes. Just prior to blooming, the "stem", calyx, and petals of the flower resemble the neck, head, and bill of a crane. The berry's prominence during the holiday season is most likely a simple matter of timing. 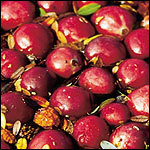 Cranberries are usually harvested in September and October and are abundant during Thanksgiving and Christmas. It certainly doesn't hurt that the red berries add a festive look to dishes and table settings. An often-asked question is whether or not cranberries were eaten during the first Thanksgiving. Until I get my time machine working again, we can only say that it's very possible. We know that Native Americans were using the cranberries (or Sassamanash as they called them) in food and medicines before the pilgrims ever arrived. They used to mix deer meat (or fish) and mashed cranberries to make jerky called pemmican. Around 1620, they taught European settlers that the cranberry's tart nature could be sweetened by boiling and adding maple syrup. Those crazy Indians were onto a good thing. We now know cranberries are rich in many vitamins and minerals including zinc and Vitamins B and C. There's evidence to suggest cranberries may help prevent urinary tract infections. In fact, the National Kidney Foundation recommends drinking a 10-ounce glass of cranberry juice cocktail if you're prone to urinary tract infections. Other possible health benefits include reduced risk of gum disease, ulcers, heart disease and cancer. So this holiday season, make sure to take advantage of the cranberry. Try asking your friends and family to "Pass the Sassmanash". When they ask what you mean, exclaim, "The crane berries!" Make the holiday table a forum for positive change (i.e. discuss the urinary track thing). Interesting Cranberry Facts: Of all commercially-significant fruits, only three - the blueberry, the Concord grape and the cranberry can trace their roots to North American soil. It takes about 440 cranberries to make a pound. In 2002, the U.S. Department of Agriculture proclaimed October as National Cranberry Month. Cran-tastic!